Your first Bible is the most important Bible you will ever receive, and the 'My Little' series has been that to millions. The bestselling My Little series, with more than 2 million copies sold, is a compact collection of books that will have a big impact on the hearts of your children. 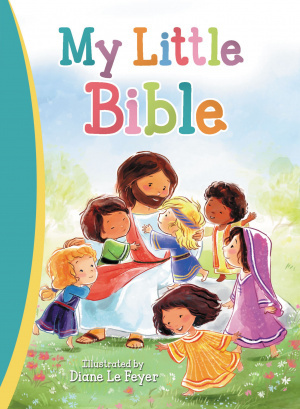 My Little Bible will help you introduce your children to key Bible stories. My Little Bible is a collection of Bible stories, including children s favourites such as the story of baby Moses, Noah, Daniel and the lions den, Jesus birth, Jesus call to love and help others, and many more. New illustrations in the same perfect format for the small hands of your toddlers and preschoolers make My Little Bible a wonderful gift for a variety of occasions, and it is just the right size to tuck into a birthday gift bag or Easter basket. Children will learn that this little book teaches big truths from the Bible." My Little Bible by Thomas Nelson was published by Thomas Nelson Publishers in June 2016 and is our 5780th best seller. The ISBN for My Little Bible is 9780718040185. Be the first to review My Little Bible! Got a question? No problem! Just click here to ask us about My Little Bible.